Villaen består af tre rummelige soveværelser med to fulde bade og grunde, der har en ferskvands privat pool med gårdhave og cabana. Veranda giver fremragende havudsigt over Det Caribiske Hav samt storslåede solnedgangssteder. Gæsterne kan nyde den dejlige 32 fods ferskvand privat pool med terrasse og cabana på ejendommen, og der er smukke nærliggende private strande til svømning inden for gåafstand. Den vigtigste lokale by Treasure Beach, der byder på mange vidunderlige madoplevelser samt en stor offentlig strand, er en femten minutters cykeltur til vest. Den længste strand i Jamaica ligger kun 15 minutters cykeltur til øst. Ideel for familier, par og grupper, Sandy Rose Villa er et godt sted at nyde Jamaicas afslappede SW kystområde. Villaen leveres med en kok og husholderske. Ena og Nadeen vil forberede lækre autentiske jamaicanske køkken. Howard, vores vicevært, kan arrangere lokale bådture. Tipping efter eget valg. Aircondition er ikke nødvendigt på villaen på grund af de de kølige bjerg / havbrise. Loft fans og gulv fans giver ekstra luftcirkulation. Gæster give og købe deres egne dagligvarer og personale kan forberede ønskede måltider. Obligatorisk personale gebyr (erkendtlighed) yderligere afhængig af antallet af gæster og sæson. Six of us stayed for 7 nights at the Sandy Rose Villa in early January 2019. We have never been out of the US for vacation before and we wanted a memorable experience with Jamaicans not on a resort. Wow, this trip exceeded my expectations! Starting with the staff who were so welcoming on the very first night. They greeted us at the van where the staff and the driver took our things upstairs for us. The cooks, Ena and Nadine, were absolutely amazing and I wish I could have a couple weeks to cook with them and learn a few things. Yes, they were that good! They also communicated to Captain Neil and Teddy to set up our boat trips. They assisted us in making a local phone call for the driver to come get us last minute to go to a street dance. We visited YS Falls, Black River (saw dolphins on the way and crocs on the river), Floyd's Pelican Bar, Accompong on their annual celebration, and sunny island. We used the refreshing pool nearly every single day. We ate fresh lobster on a couple of excursions which was amazing. We had a bonfire on the beach on our last night. Amazing! If you are looking for a vacation that is away from all the hustle and bustle of the city, this place is perfect. There are drivers that you can get to take you where you'd like to go. Both drivers are great. I wouldn't want to navigate those roads! While every vacation has a least favorite part, we all say it was the lack of warmer water for the shower. It's solar heated so the luke warm water didn't last long. For us, that wasn't a huge issue though and we would most certainly stay again. I can't wait to see our new friends in Treasure Beach again! Seriously consider a stay here...it's worth every penny and more. Also, don't forget to tip the staff, they work hard! David, his wife Jenneka and their friend Bob were a pleasure to host.. Our staff Ena, Nadine and Howard were treated very well and would be happy to have them back for another vacation. Excellent getaway from the hustle and bustle of life, though still having the modern amenities. This properry is exactly as described, the staff is great. Our family of 5 (kids age 13, 10, and 7) had an incredible time on our first trip to Jamaica staying at Sandy Rose. The house is perfect, well set up and taken care of, and in an unbelievable location. Treasure Beach is a quiet and very cool get away from it all kind of place, and Sandy Rose even more so. Ocean access is right down the road and pretty much your own private beach, and the pool is great for kids. Ena and Nadine are outstanding cooks, and Howard is the consummate tour guide. There are a ton of activities in the area, including a trip to pristine YS Falls, and a boat trip up the Black River with Lobster lunch. We really can't recommend it enough. We stayed at this villa for a week in July and had the most amazing holiday. Ena, Nadine and Howard (the staff) were truly fantastic. Ena and Nadine provided some of the best meals we have ever tasted and Howard made sure our 15 year old son felt at home, by inviting us all to a local cricket match and inviting our son to play football with the local village team. All of the locals were so friendly we truly felt at home. The villa itself is well kitted out with everything you need and the owner, Adaria, was absolutely fantastic with regular contact throughout and answering my many and varied questions prior to our arrival. The villa is off the beaten track and it would have been a good idea for us to hire a car rather than rely on the local taxi company, which turned out to be more expensive than we expected. 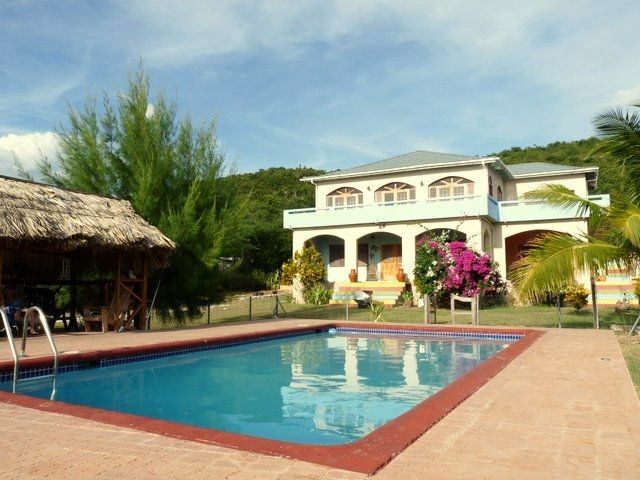 However, now we have experienced a Jamaican holiday, would definitely return to this villa in the future (with a hire car!) and can highly recommend a stay here. If you want to experience local culture and immerse into local life, Treasure Beach is the place for you. The endless beaches are almost deserted and there are hardly any other tourists, which we loved. Treasure Beach er et uspoleret serie af fiskerlandsbyer 30 minutter øst for Black River. Lokale aktiviteter omfatter svømning, snorkling, vandreture, cykling og bådture. Spændende båd ture i Black River, Jamaica største og tredje længste flod, omfatter mangrover, fuglereservater, krokodiller og et stop på Pelican Bar (en cool bar med hængekøjer i midten af ​​havet). Denne båd tur kan startes direkte fra Sandy Rose Villa på strandpromenaden i bydelen. Andre attraktioner omfatter YS Falls, et spektakulært vandfald med pools, reb gynger, og haver, ture i Appleton Rum Factory, et besøg på elskers Leap, en 1.700-fods klint overhængende havet, som har en betagende udsigt, golfbaner i Mandeville, og Alligator Pond byder 'Lille Ochie «fiskerestauranter. Den årlige Calabash Literary Festival hvert år i maj tiltrækker kunstnere og digtere på verdensplan. Der er også mange gode restauranter / barer i Treasure Beach, herunder vores favoritter, Jakes, Jack Brisling, og The Wild Onion.